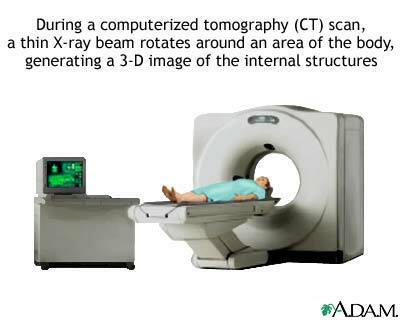 CT stands for computerized tomography. In this procedure, a thin X-ray beam is rotated around the area of the body to be visualized. Using very complicated mathematical processes called algorithms, the computer is able to generate a 3-D image of a section through the body. CT scans are very detailed and provide excellent information for the physician.